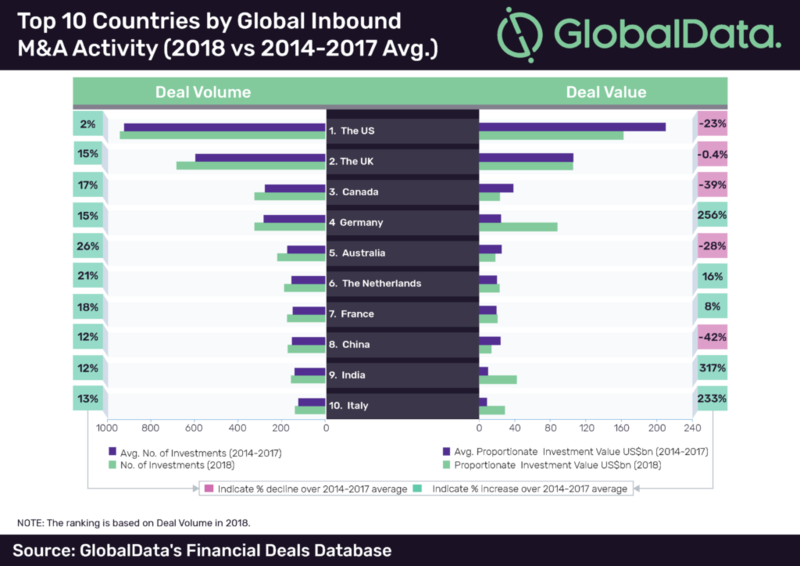 The US occupied the top position in terms of outbound and inbound M&A deal volume and value in 2018. However, it lagged behind other countries in terms of volume growth in 2018 compared to 2014-2017 average, according to GlobalData, a leading data and analytics company. The US witnessed more than 1,400 outbound M&A deals worth US$216bn in 2018, which was the highest among all countries. Though the disclosed deal value increased by 38% during the year, deal volume declined by 9% compared with 2014-2017 average due to growing protectionism and continuous measures to curb outbound investments. The downward trend can also be attributed to recent tax reforms in the US, which have encouraged domestic companies to withdraw or restrict investments in foreign countries. 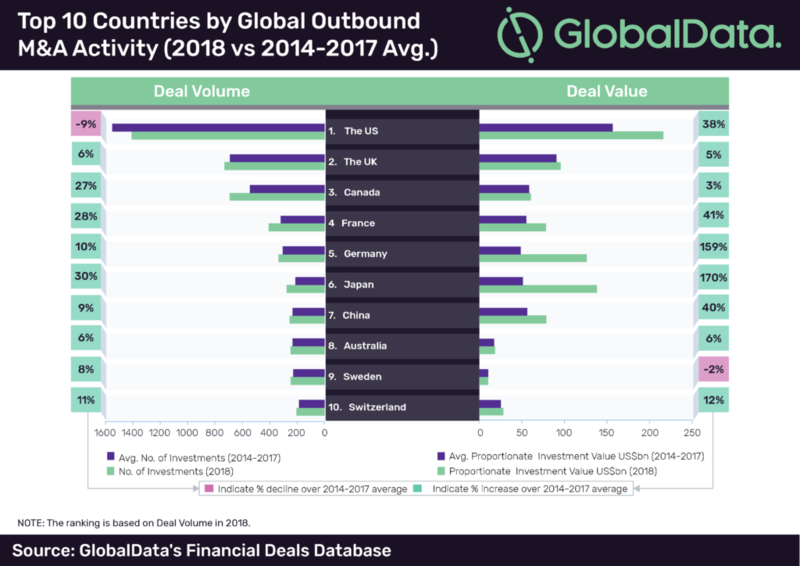 The UK stood in second position with more than 700 outbound M&A deals worth $96bn in 2018. However, the country’s growth in outbound M&A volume and value compared to 2014-2017 average was relatively less than most of the countries in the top 10 list. The country registered 6% growth in deal volume and 5% growth in disclosed deal value in 2018 compared to 2014-2017 average. Japan registered the highest growth in deal volume and value, mainly driven by a saturated home market due to the shrinking population. This has forced domestic companies to find new growth avenues outside the country. The US also led the way in inbound M&A activity, with more than 900 transactions amounting to US$160bn in 2018. However, it witnessed a 23% decline in value and almost consistent volumes of inbound M&As during the year compared to 2014-2017 average. The decline can be attributed to increased political intervention and regulatory scrutiny of deals. For instance, in January 2018, the US blocked the acquisition of MoneyGram by China’s Ant Financial citing national security concerns. Countries such as Germany and Canada also clamped down on Chinese investments or resisting acquisition of domestic companies by Chinese firms. Germany blocked the acquisition of Leifeld Metal Spinning by Chinese firm Yantai Taihai in August 2018 and Canada rejected the sale of Aecon to China Communications Construction in May 2018. In response, China has also been resorting to trade war by blocking attempts of its western counterparts to acquire global companies doing significant business in the country. Though China’s inbound M&A deal volume increased by 12% in 2018 compared to 2014-2017 average, it registered the highest decline of 42% in value terms among the top 10 countries. Australia registered the highest growth in inbound M&A volume while India registered the highest growth in value terms in 2018 compared to 2014-2017 average. Some of the notable cross border M&A activity deals announced in 2018 include Takeda Pharmaceutical’s acquisition of Shire Plc for enterprise value of US$80.4bn, Comcast Corporation’s acquisition of Sky plc for US$39.8bn, Vodafone’s acquisition of Unitymedia for US$21.9bn and Walmart’s acquisition of 77% stake in Flipkart for US$16bn.